Jose Mourinho has drawn level with Sir Alex Ferguson on seven semi-final appearances in the Champions League after his Real Madrid side got past Galatasaray in the last eight on Tuesday. Mourinho led Madrid to the last four of Europe’s premier club competition in each of his first two seasons at the Santiago Bernabeu, and his team made it three in a row with a x-x aggregate win which included a 3-0 victory at home last week and a x-x in Istanbul on Tuesday. Madrid are still aiming for their 10th trophy – La Decima – in the history of the European Cup and the Champions League, while Mourinho has admitted he hopes to become the first coach to win the coveted crown with three different clubs. The Portuguese made his Champions League debut in 2001-02, when he took over midway through the season at Porto, but won the competition in his first full tilt at the title, in 2003-04 (having claimed the Uefa Cup in 2002-03). That turned out to be his only Champions League semi-final appearance at Porto as he moved on to Chelsea that summer. And he took the Blues to the cusp of European glory, losing out at the semi-final stage in both 2005 and 2007. On each occasion it was Liverpool who got the better of his side, with the Reds benefiting from Luis Garcia’s ‘phantom’ goal on the way to the trophy in 2005 and then advancing on a penalty shootout two years later. Mourinho left Chelsea shortly into the following season and did not return until the next campaign, when he agreed to coach Inter. His first season in Milan ended with a Serie A title, but disappointment in Europe as the Nerazzurri exited to Manchester United in the last 16. However, the Portuguese led the Italians to treble glory in 2009-10, as they claimed the Scudetto, the Coppa Italia and the Champions League – Inter’s first success in Europe’s premier club competition since 1965. 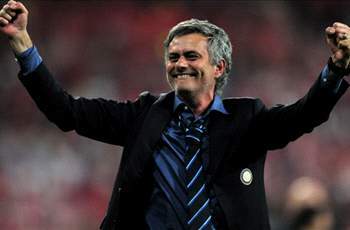 That was Mourinho’s second Champions League victory and his fourth semi-final in the competition. With three more since added in consecutive seasons at Madrid, he has now equalled Ferguson with seven last-four appearances. All of Ferguson’s semi-final showings have come in his remarkable 26-year tenure at Manchester United. The 71-year-old Scot has led the English side to two Champions League wins, as well as two further final appearances (both lost to Barcelona). Defeats in his other three semi-finals (in 1996-97, 2001-02 and 2006-07) also all came against the competition’s eventual winners – Borussia Dortmund, Real Madrid and AC Milan, respectively. Mourinho, meanwhile, lost his last two semi-finals against Barcelona (in 2010-11) and Bayern Munich (last season). The Portuguese has also now made it four semi-finals in a row – a feat achieved by only Helenio Herrera, Marcello Lippi, Vicente del Bosque and Pep Guardiola in the past, while his latest las-four appearance sees him at the top of a distinguished list of coaches, alongside Ferguson, and given he is over 20 years younger than the Manchester United boss, Mourinho is probably just getting started.